A world where the skies seem bigger, the white sand beaches stretch as far as the eye can see and the horizon disappears into infinity sounds as though it must be thousands of miles away. But, you’d be wrong, the Isles of Scilly are a paradise close to home, where the stress of everyday life is forgotten and natural beauty, peace and a slower pace are at your fingertips. Outstandingly beautiful, uncrowded and unspoilt, the Isles of Scilly nestle just off the Cornish coast but seem like a world apart. The pace of life is slow giving the whole family the chance to indulge in simple pastimes like combing the seashore or enjoying leisurely bike rides. Aside from the deep sense of tradition, visitors are captivated by the sights and scents of the sub-tropical plants that give Scilly its distinctive landscapes; the array of birds and marine life; the long stretches of largely deserted fine white sand beaches and a plethora of tiny inlets, coves and rocky outcrops that punctuate the more rugged coastlines. There are five inhabited islands (and some 140 uninhabited ones) to explore: St Mary’s, Tresco, St Martin’s, Bryher and St Agnes. St Mary’s, the largest island, is the gateway to the rest of the Isles of Scilly. Hugh Town is the central hub with its cluster of shops, banks, churches, cafes, galleries, reataurants and pubs, as well as the wonderful museum. It has three lovely beaches in very close proximity – Porthcressa, Town Beach and Porthmellon. Tresco is the second largest of the islands and a subtropical gem. The only privately owned island within the archipelago, it has a little bit of everything, from dramatic rocky outcrops, Bronze Age burial sites and romantic castle ruins, to secluded sandy beaches and not forgetting the world-famous horticultural paradise of Tresco Abbey Garden. St Martin’s may be just two miles long, yet has some of the finest beaches in the British Isles, if not the world. Whether searching the rock pools in Lawrence’s Bay, or taking a dip in the water off Par Beach or simply chilling on Bread and Cheese Cove, Great Bay or Little Bay. Additionally, the spectacular flowers, plant life, rare birds and sensational sea views from the cliff path walks all add to the unmistakable beauty. Bryher is the smallest of the inhabited islands and the perfect place to enjoy a taste of untamed Scilly. Whether you’re exploring rocky coves, lazing on white sandy beaches or hiking up one of its small granite hills to admire the views, Bryher is simply wonderful. On the south westerly edge of the Isles of Scilly, St Agnes is totally unspoilt and astonishingly peaceful. It measures just a mile or so across and its closest neighbour is Gugh, to which it is joined by a sand bar at low tide. Inland are quaint cottages and a patchwork of flower fields, while a lighthouse stands at the highest point. Can’t decide which island to visit? Well there’s no better way to experience Scilly than island hopping! You can reach any island from another in just 10-20 minutes by boat, making it very easy to discover a new island in a day, or alternately, split your stay over 2 or 3 islands. If you’re looking for things to do on Scilly, you won’t have far to search. From dawn to dusk (and later if you like) there are awe-inspiring sites, amazing sporting activities, wonderful galleries and craft shops to browse, unique attractions and fabulous places to eat. Scilly has an amazing heritage with maritime shipwrecks. Our vastly experienced travel advisors are passionate about the Scilly Isles Holidays. With first-hand knowledge of when and where to go they can create the perfect holiday experience for you, at the best possible price. Geography: Comprised of over 140 rocky islets the Isles of Scilly lie 28 miles from Land�s End off the coast of Cornwall. 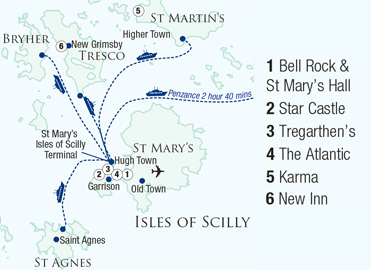 The largest island, St Mary�s, covers an area of only 2.5 square miles. Of the other islands, known as the �Off Islands�, Tresco, St Martin�s, Bryher and St Agnes are the only inhabited ones. Travelling times: The ferry from Penzance takes 2 hours 40 minutes whilst flights operate from Land�s End, Newquay and Exeter with flying times varying from 15 minutes from land�s End to 1 hour from Exeter. There are no flight or ferry services on Sundays. Transfer times: On St Mary�s, as you�d expect, a matter of minutes. If you are continuing on to the Off Islands, then you�ll need to take one of the local boats, which you pay for locally, and which operate regularly between the islands. Passports & visas: The Isles of Scilly are part of the UK, so none are required. However airlines do require photo ID.